This report produces a detailed page of information per student. 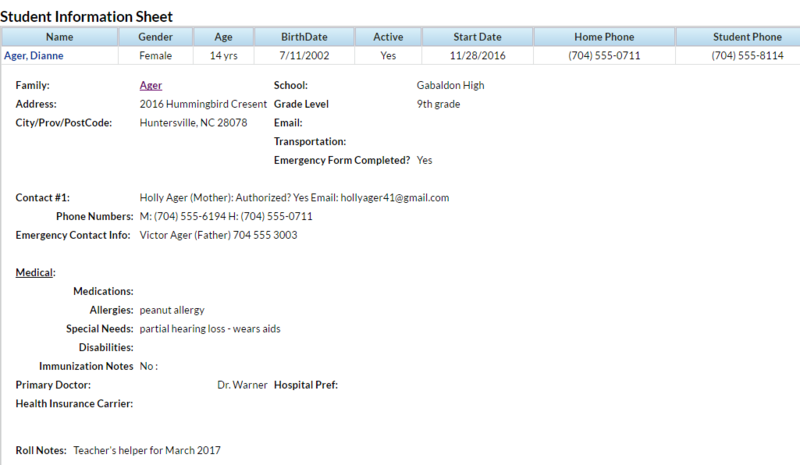 By default this report displays address, contact information, medical fields, and roll notes. Use the display settings to include additional information such as student picture or user defined fields. Student info sheets can be generated for multiple students or an individual student using this report. If you are using the Staff Portal this student information is available in the instructor's portal. These student info sheets can be distributed to instructors in cases where the Staff Portal is not being used. Due to browser limitations, the report will run a maximum of 1000 students.